Showing results for tags 'Twilight'. Celestia had sent the notifications out a week in advance to allow ample time for all parties to make arrangements to be free for that day. She notified the public that official court was cancelled for that day, as well as posted extra guards to allow for the princesses to be more able to concentrate on matters at hoof rather than ponies walking up to them with business that was not so pressing. It was not that Celestia did not love her ponies, in fact she adored each and every one of them. But there were times where she needed a day to settle more private matters with her fellow princesses. Matters of state, planning of events and specific meetings, gathering and analyzing information, assessing threats more deeply, the list went on. Celestia had the private study furnished for such gatherings. Today had a semi-full list of affairs, as each princess would bring a short list of their own. 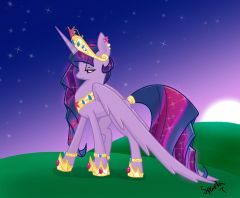 Celestia looked down her own list, bandit groups at the boarders, redecorating the palace, and the planning of the annual gala event. As she walked to the study, she had her head on these matters, but also tried to sort out how to broach them with her fellow princesses. Her sister was often more direct, and apt to have a simpler solution to matters. That was perfect in some situations, however others required a more finessed approach. Other still needed a more critical mind than either of them, of which Twilight possessed. Celestia was never not surprised by how detailed Twilight could get with the slightest thing. Though it often made her giggle when she saw her former pupil stressing over something that she thought was an important matter. 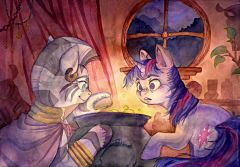 For Celestia and Luna, these things had become trifles. Though their lengthy tenure of leadership had taught them many hard lessons on what was most important to a princess. Entering the study, Celestia sat herself at the table and waited for the others to arrive. Tea was already prepared and waiting, as was a small selection of fruits and sandwiches. Celestia preferred the simpler foods, as well as the sweet treats she allowed herself from time to time. And she hoped her selection of food was desirable for her friends. She knew some of what Luna liked, however Twilight had been away long enough that her tastes may have changed. As the solar princess set her papers down and began sorting out some parchment and ink, she paused and then sent a note to the kitchens to have extra treats prepared, just in case this ran longer than normal. In this episode, Twilight Sparkle and her family's cruise vacation is actually a themed vacation where ponies have paid for the privilege of spending time with her, and she must please both her family and the cruise attendees.The episode aired Saturday 11:30 AM EST on October 7th!! This thread is dedicated to discussing the episode before, during, and afterwards. As the thread is now open it may indeed contain spoilers. I ask that potential spoilers talked about or shown before the episode airs stay within the spoiler tags please, after the episode you no longer have to use the spoiler tags, but warning, if you haven't seen the episode yet after it airs, this thread no doubt will have all sorts of spoilers in reviews, images, etc. So tread at your own risk! Thunderbuck had taken his cart into town now. His niece peeking out of the open window up front. She was calm, watching the various other ponies walk past. Buck pulled the cart alone, his magic making it lighter and rolling on its own. As he came to an empty spot, he parked the cart and unhitched himself. CaramelCream busied herself inside with finding a few things. The coin case they used to collect anything the ponies offered. her basket, which she normally sold backed goods from. Though at the moment it was empty. She looked around and spotted the coin pouch Buck had for buying supplies. Picking it up in her magic she pulled her basket in her teeth and slipped out the back. She was headed for the town center. She was intent on buying supplies for the two of them for a few days. She wondered how successful her uncle would be here. This town didnt seem to have any performers standing around yet. But maybe they came at a different time of day. If that was the case, uncle Buck would have the town to himself for at least a little while. Thunderbuck was in the cart, looking at the by laws of Ponyville, He had left the side windows open in the event some pony wandered up. he did offer instrument repair as well as street music. The posters on the side listed his prices. As he was looking over the laws to see if he needed a license to perform here in Ponyville, he paused to look up toward where Caramel was walking. This town was peaceful and the foal was old enough to use her magic if she needed. He had taught her how to teleport if she needed it. But it was just one of the few spells she had. She was learning the lightning magic that was common to their family. At least she need not worry about bullies with that in her saddle bags. 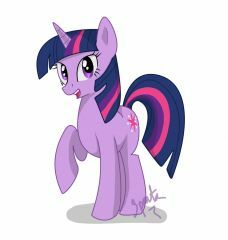 Remember when Twilight Sparkle was just a unicorn and didnt throw the community into civil war as a result of her new Princess status? Yeah I can't either. Controversy and lols aside, I needed something to do and to get out of this art slump. Plus I felt rusty. 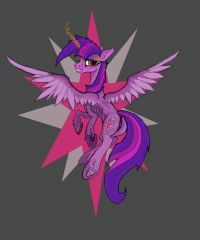 So I decided on a quickie of Unicorn!Twilight Sparkle. Not much to say here, but I like how it came out. 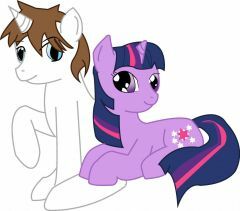 © Twilight Sparkle belongs to Hasbro, art is mine. Print available for purchase! Please contact www.tealeafillustrations.com! Twilight really dolled up for the photo-shoot today. I'll admit the looks she was giving made it hard to take the picture. This is a free avatar that anyone can use. I've never drawn Twilight this good, so don't let it go to waste! 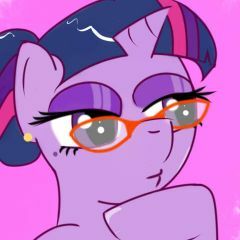 Also Ponies in glasses are the best thing ever. This is a little one-off I whipped up in the wee hours of the morning after pulling an all-nighter - which might explain some of the sloppy writing. The idea came into my head and I just had to get it down on paper (metaphorical paper, meaning I actually typed it out on the computer instead) before I lost my train of thought. Bonus: Some Twilight/Luna shipping. "Are you alright?" A monotone voice asked. 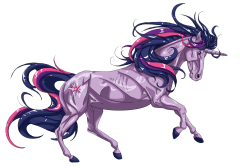 Twilight had heard the soft clopping of hooves tread across her bedroom chamber's floor, the gentle wisp of fresh air that seemed to follow the Princesses wherever they went. She immediately knew who this was the moment she stepped into the room. "Of course, I am," she responded with slight bitterness. "Are you really?" Twilight's eyes dropped to the floor sullenly. "What do you think?" Princess Luna was silenced for a moment. "Your friends are waiting in the throne room. They wish to speak with you." Another momentary pause. She continued with a more softened tone, taking a few pleading steps forward. "Please, Twilight. You've put them through so much, and they have yet more to bear. Do what you must... but don't deny them what they so greatly deserve." Resolution seemed to pass over the violet pony. With short breath out, she turned to face Luna. Nearly passing her, she added coldly, "I kindly ask you address me with the same respect I give you; my proper title is 'Queen Twilight.'" Luna's eyes never left hers. "As you wish, your highness." She had dreaded this day ever since she had met them, and even more so now as each step down the thin corridor seemed to swallow her whole. Her friends - the ones on which she depended on... how could she face them head-on at a time like this? How could they understand what she was trying to accomplish? Twilight hadn't even written to them ever since the start of the Harmonic War. There was too much water under the bridge. So much weight was on her shoulders she could hardly bear it. Celestia had given her the Queen's title after her tragic death. She had more trust in her pupil than her own sister. Here she stood, gazing into the forlorn faces of her faithful allies. Even though times were bleak, there still was a gleam of hope in their eyes; a hope that couldn't be shattered by anything. But Twilight fought to ignore this. "Twilight!" Applejack was the first to speak. Happiness practically radiated from her. She acted as though she was meeting a long-lost relative for the first time. 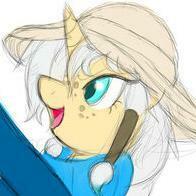 The mare leaped over to the Queen and gave her a friendly nuzzle on the cheek. This embrace was just the kind of interaction Twilight had been craving for what seemed like forever. A warm, fuzzy feeling entered her stomach for a brief moment. She looked up. Although the others weren't as forthcoming as Applejack, they had the same expression on their faces - unadulterated love. "We were worried about you, Twilight," Fluttershy's gentle voice twittered with a small smile. Rainbow Dash was rather apologetic. "We thought you forgot about us or something." The words crawled out of Twilight's throat. "I could never forget about you guys." She smiled wanly. "You know, Twilight," Applejack began. "Whatever happens, we'll have your back. We only want what's best for you, sugarcube." "So maybe we can talk about this first?" Pinkie Pie chimed in hopefully. "There's nothing for us to discuss." Rarity brought her argument to the table. "Please now, Darling. If we only could think this through for a minute... we've been through complicated situations before..." "I have thought it through. Do you think I'd be so ignorant as to rush into something when I didn't know what I was doing? Just who do you think I am?!" A shadow seemed to pass over the room. This is what the Queen had feared. Nobody dared speak, for fear of shattering the silence that perpetrated the castle. Her friends' smiles disappeared. With one backward glance to them, Twilight exited the room. "I wish you all the best in the world." The note of sincerity in her final words could not be missed. "You don't have to do this." All the harshness had left Luna's mouth, replaced only with pleading. Twilight paused. "If you saw a foal lying injured on the side of a road, wouldn't you stop to help it? You'd be compelled to - you'd have to. I have to do this because... how could I live in a world that I had destroyed by my own neglect?" Her hooves gently pawed at the Elements strewn across the floor by her hooves. Using her alicorn magic, she took the crown from her head and placed it on Princess Luna's instead. She looked at the wall ahead of her. A tapestry was hung from the ceiling; it was skillfully made so that the pictures strewn across it told a story - her story. From her fillyhood days, to when the Elements of Harmony were reborn, and finally to her wretched rise to power. Looking at these harrowing pictures, a sliver of fear passed through her spine. There was no dignity left in this fallen kingdom. 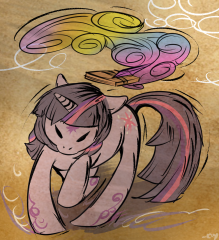 Twilight turned her head back to Luna quickly as the magic spewed from her horn into the Elements. Her breathing hitched. She stared at Princess Luna whose whole face was shrunken with grief, eyes glistening with tears. How they shone like stars. "I'm sorry." With a single blast of energy, the elements shattered into an array of light. And then she saw nothing. And there was nothing. Nothing but the hope for peace she had left in her wake. 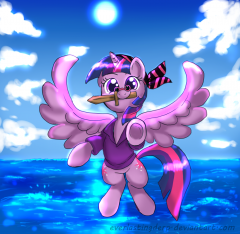 Twilight, y u so adorkable? Just another calm day... no way it'll last. © Twilight belongs to Hasbro, art is mine. © May use as vector, if not claiming as own. 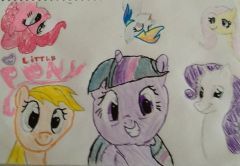 From the album: My little pony fim! I made this in two days! Please appreciate it! 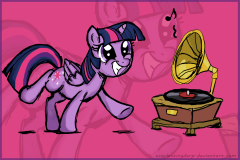 Twilight's BBBFF Song, what does it sound like? Okay. From 0:00 to 0:29, does this song sound really eerily familiar to anypony? I feel like I heard the opening phrases there in some other song 1000 times over. Especially from the Flashback shots to :29. Can anypony answer what song that part sounds like? Because this song sounds like I heard very Very Similar Melodic phrasing in a pop song or two from ages past. Really, the entire song sounds like one I heard before. Can any, and I mean ANY pony answer this nagging itch at the back of my skull? From the album: Kayzios art! © Art is mine, that is all!